An engineering company has asked your design team to design an quality symbol that represents the accurate / precise products they manufacture. It will appear on all their packaging. The company has asked that the symbol include a picture of a special tool called a ‘micrometer’. A micrometer is used for highly accurate measuring and is a vital measuring device in the engineering world. A letter ‘Q’ should also be included (the ‘Q’ stands for Quality). Two possible answers are seen below. Write about the features you like and those aspects of each symbol that need improving. A space is provided underneath each symbol for your written answers. 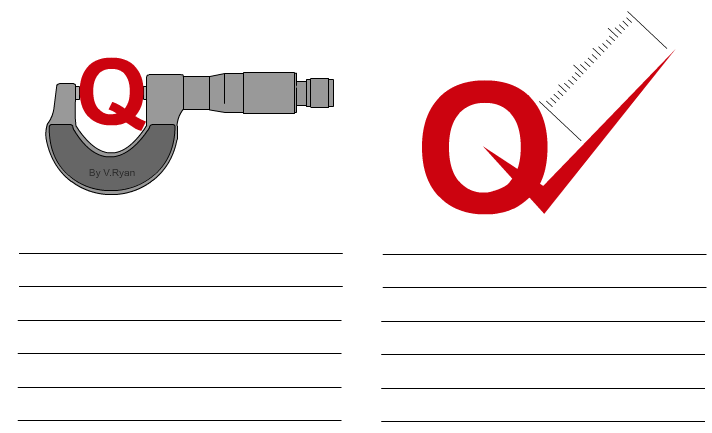 In your opinion - which of the engineering ‘quality’ symbols is the most suitable? Explain your choice of symbols. Now design your own engineering quality symbol.